First off the bat, I would like to say I have purchase Jetkids at full retail price. I will be sharing my experiences while travelling with my 2Y7M daughter on EVA airline economy class. The Jetkids had great maneuverability, it glides around like a dream as seen in the video. Also I like that it's relatively light weight (~3kg including bedding). It include a strap for pulling the luggage, which also doubles as a shoulder strap when needed (such as during boarding). I forgot to take a photo of the inside compartment, with all the bedding wrapped up inside, there really wasn't much room. All we could fit in there was a toddler pillow and some small toy. 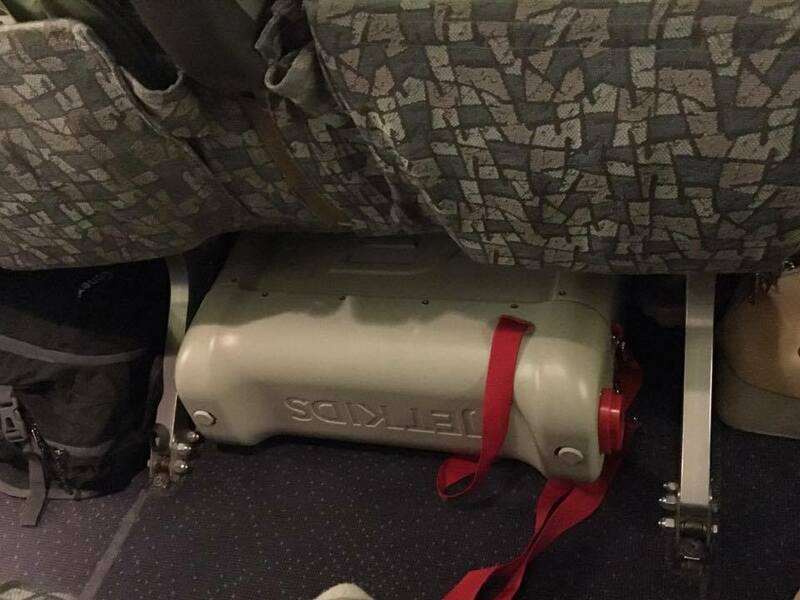 It also fits right under the seat with not much room for anything else. 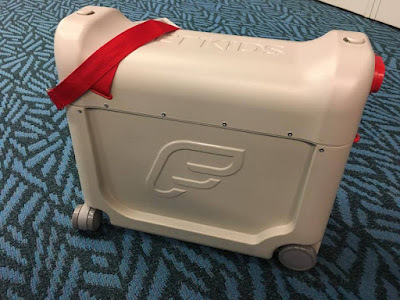 The shorter red strap seen in this photo is for the child to hold on while riding on the luggage. The adjustable height function of the lid was great, as it really did level well with the seat. 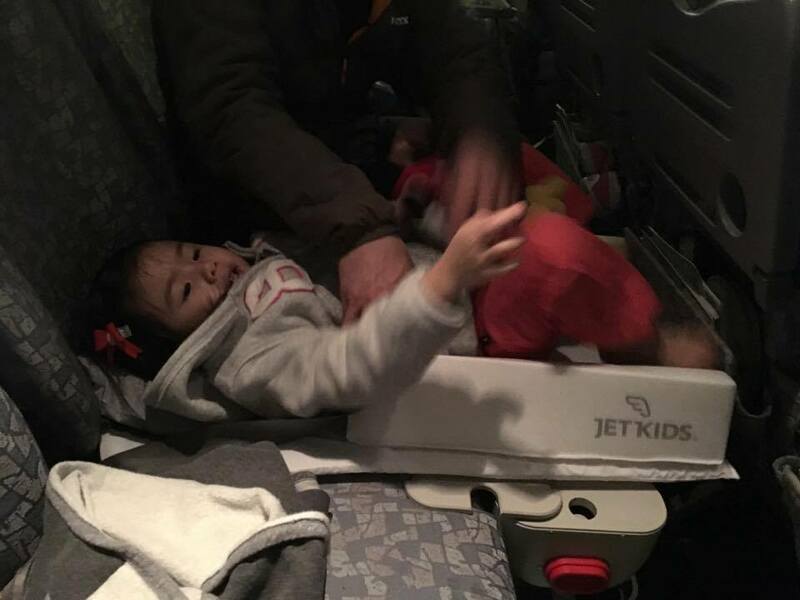 On our flight there, we thought it would be "better" if our daughter head was on her seat, because 1. we can buckler her body in. 2. the recline of the seat in front would have no interference with her sleep. Boy were we wrong, she did not sleep well at all. She would move around and end up pushing herself higher up, this result in her sleeping in awkward angle with her face/head somewhat resting on the chair back. Also her legs/feet couldn't move around much due to the recline of the seat in front. On top of that we were also trying our best to prevent her from kicking the seat in front. I guess she really wasn't all that comfortable, thus she woke up several times. 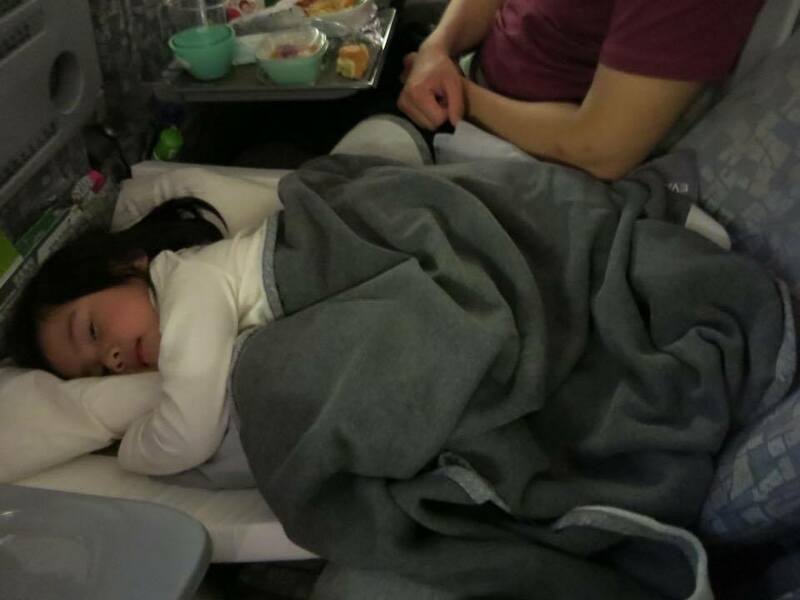 Therefor during our 12hr flight, she only slept a total of 4hr in fragments and was overall in a cranky mood. On our way back, we follow direction and it worked wonderfully. She slept for a good 6.5hr and woke up happily. Needless to say the journey back was a breeze with a happy toddler. She spent the rest of the time either eating or watching cartoons. (side note, the earphone on the plane doesn't work for toddlers, on our way back we got this cheap one from Daiso and it worked out great, as she can finally hear everything). One concern I had prior to travelling was the spacing for the head once the seat in front was fully reclined. As you can see in the above picture, there are still plenty of space, and it really did not bother her at all. For reference my daughter is 92cm, and she just fit. Personally I think she will probably outgrow the lying down perk by 95-98cm. Despite all the things I love about this ride on luggage, there are a few things I wish they could improve upon. 1. The pulling/shoulder strap was short. I am 165cm, and the strap is just barely long enough for me to pull comfortably. I think if they an make the strap adjustable, it would be so much more versatile for people of different height. 2. I wish they had included a wheel lock so it can be further stabilized during the flight. I know the shoulder strap can be wrapped around the chair in front, but it's very hard to bend down and do such thing with such limited spacing. Also with our Eva flight configuration, there really wasn't anywhere we could wrap the strap around. 3. This last one is a personal complaint of mine, as I had to pay a hefty import duty (Canada) because of the lack of description on the packing slip. It simply list the products name: Jetkids bedbox, which made the CBSA automatically assumed it's bedding, and charged me a hefty 18% import duty on this item. I am currently working on getting back some of that duty thru the duty refund program (should be about 8% for luggage). Overall, I have to say Jetkids is a well thought out product and it definitely worked for us. 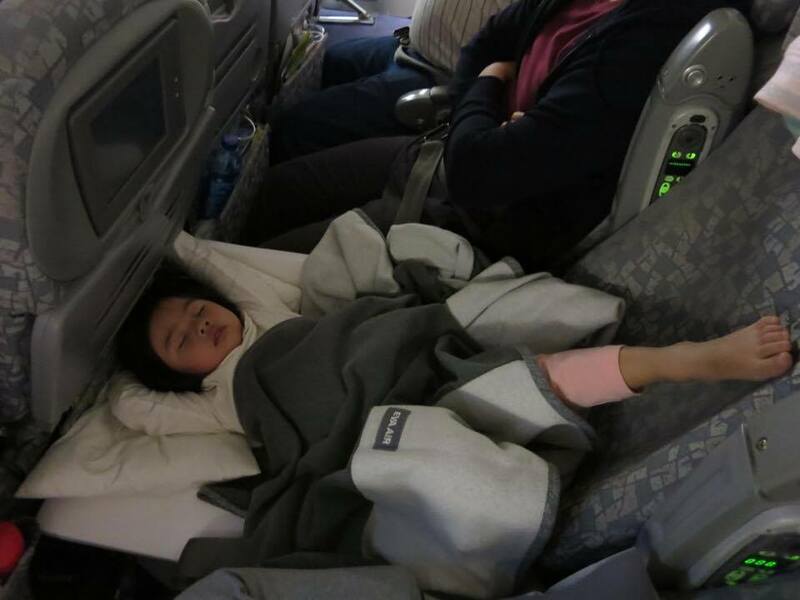 I just wished we had discovered it earlier, as my daughter will outgrow the flying lying down perk real soon, as least she loved the ride on part which will last us awhile. So if you have a toddler/baby and intend to buy them a seat, definitely consider the Jetkids, as I certainly recommend it!